Tata Motors, the number 1 commercial vehicle brand in Nepal, today announced the roll out of Tata Yodha in association with Sipradi Trading (its authorized partners in Nepal). L to R – Mr. Bodh Mukhia – Head Operations, Nepal & Bhutan, CVIB, Mr. Asif Shamim – Regional Manager, South Asia, CVIB, Mr. Rajan Babu Shrestha – CEO, Sipradi Trading, Mr. Siddharth SJB Rana – Chairman, Sipradi Trading, Mr. Rudrarup Maitra – Vice President, CVIB, Mr. Saurya SJB Rana – President, Sipradi Trading and Mr. Rajesh Giri – COO, Sipradi Trading at the launch of Tata Yodha in Kathmandu today. Tata Motors, Nepal’s No. 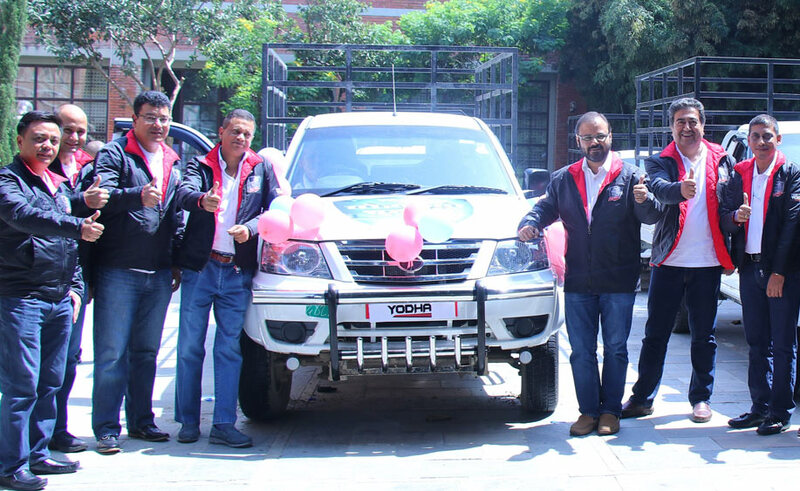 1 commercial vehicle brand, in association with Sipradi Trading (its authorized partners in Nepal), today announced the roll-out of the Tata Yodha at an event in Kathmandu. The Tata Yodha comes with impressive features that give it a competitive edge. It will be available in multiple variants equipped with a powerful 85 HP 3.0L engine generating 250Nm of torque, making it a category leader. This, along with its best in class ground clearance make the new Tata Yodha suitable for diverse business requirements like transporting agri-produce (fruits and vegetable), poultry, fish, milk, cash van, service support vehicle at construction sites etc. According to Mr. Rudrarup Maitra, Vice President-Commercial Vehicles, International Business, Tata Motors Ltd., "Tata Motors is Nepal’s No. 1 commercial vehicle brand. It is our constant endeavor to meet customer requirements. Tata Yodha has been conceived after taking thorough feedback from the customers and keeping their day-to-day requirements in mind. It is a workhorse that will put in as much effort as the user, in his business. Tata Yodha promises non-stop performance, unmatched comfort, integrated safety features, stylish looks and assured service guarantee. Over the next six months, we look forward to launch many new variants, under the Yodha platform." According to Mr. Saurya SJB Rana, Director, Sipradi Trading, Nepal, "Our association with Tata Motors dates back to August 1982. Over the years, Tata Motors has expanded their position in the Nepalese market and we at Sipradi will continue to support these products with the best purchase and high quality after sales service experience. The Tata Yodha with its promising features strengthens our belief in Tata Motors vehicles, which are known to offer high value proposition to the Nepalese customer, for their utility, ruggedness and fuel-efficiency." Sipradi a major player in AUTOMOTIVE & ALLIED business and is one of the largest and most prestigious brands in Nepal. 35 years down the line, Sipradi has exceeded USD 350 million annual revenue and is growing rapidly in automotive, energy, lubricant, financial services, and equipment businesses. It has 750 employees and 650 support staff working to a common goal –to deliver quality products and services while adding synergy to the growth of overall brand value. Sipradi Trading Private Ltd (STPL) has been the exclusive distributor of Tata Motors Ltd in Nepal since 1982. STPL is an ISO 9001:2008 certified company. STPL sells and services the full range of Tata Motors’ commercial and passenger vehicles. The company has the largest sales and service distribution network throughout Nepal. It has 18 sales offices and 24 service centers dedicated to Commercial vehicles manufactured by TATA Motors Ltd., India. It has 20 showrooms and 24 service centers dedicated to Passenger Vehicles manufactured by TATA Motors Ltd., India.